A protest was held outside Leinster House calling for the transgender bill to be amended. A PROTEST WAS held outside the gates of Leinster House this afternoon over the proposed Gender Recognition Bill 2014. 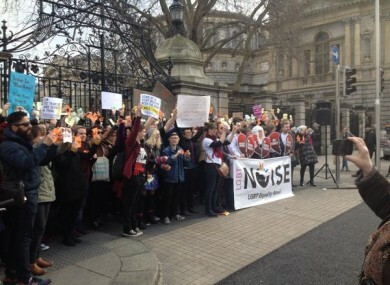 The rally, organised by the human rights group LGBT Noise, heard from transgender people demanding amendments to legislation which is currently being debated in the Houses of the Oireachtas. Those at the protest said the current measures make the scheme inaccessible to married transgender people who would be forced to divorce to have their chosen gender recognised. The crowd held symbolic broken hearts reflecting their feelings on ”significant flaws” in the bill. Senior Solicitor with the Free Legal Advice Centre Michael Farrell said, “The transgender community has had to wait for far too long for Gender Recognition legislation. The least the Government can do, to make up for the years of neglect and worse, is to make this Bill as inclusive as possible and ensure that no other trans persons have to go down the same lonely road that Lydia Foy had to travel for the last 18 years. In October 2007 Foy won a High Court case when the court ruled that her rights under the European Convention on Human Rights had been violated by the failure to recognise her in her female gender. Sinn Féin MEP Lynn Boylan attended the rally and said, “The Government’s Gender Equality Bill is an insult to Transgender people and should be amended to respect their dignity. A persons gender identity is a matter for each individual. Transgender people know their own identity. They don’t need medical evaluation to prove their identity to anyone. “Furthermore, no person should be forced to get divorced in order to have their gender recognised. Email “'Nobody should be forced to get a divorce to have their gender recognised'”. Feedback on “'Nobody should be forced to get a divorce to have their gender recognised'”.